Hebe International skin care Zhao franchise fraud by asking franchisee to invest their money for him to producing counterfeiting supplement whitening pills and Miracle Care skin care set. By holding on 50% of the franchisee franchise fee, not releasing the money, when their account is lower than 50% of their franchise investment, Zhao will ask them to fund their account again, these policies are never mention before they sign their contract. He is asking his own franchisee to invest in the products he produced, using his franchisee as a tool to sell his counterfeit products to customers. In 2017, there are a lot of people on wechat and instagram starts to sell a product named Crystal Tomato pills, so where does this brand came from? 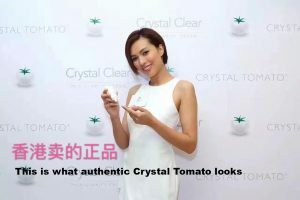 Crystal Tomato is a famous brand from Singapore, they are made in USA and only sold in clinics in Singapore. The famous Chinese celebrity GiGi Lai also sells this brand in her clinic in Hong Kong. 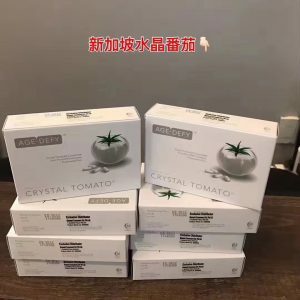 So Crystal Tomato is getting popular in China since then, and there are a lot of people trying to buy them in Singapore and asking Singapore sellers to delivery to China. Since this brand is very reputable and been selling in Singapore for over 5 years, so it attracts a variety of China scammers who wanna make high profits in unscrupulous ways, Zhao from mainland China Henam, who is one of them. This scammer from Henan China, rent a place in Seoul, Korea, to try to manipulating a Korean skin care center in Seoul, to try to misleading Chinese investors to become a franchisee and invest money for him to producing fake. He holds his own franchisee 50% of their franchise fee without giving them products, he then asking them to refill their money even they have 50% of their franchise fee in their account. He did not stated this before they sign a contract, so a few of their franchisee found that this is actually a scam because they do not want to sell fakes. He first lied to those franchisee that he has got the distributing rights for Crystal Tomato, and using Crystal Tomato product picture and videos to advertise in his own wechat moments, and once when customer gets the product, its actually called MDS tomato. 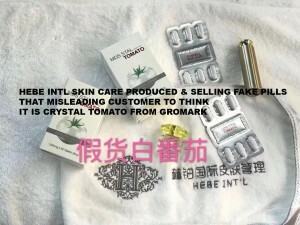 The package looks similar, he told the customer that this is the Korean version of Crystal Tomato, because the import tax is very low in Korea from USA, so they can sell 1/3 of the price compares to Crystal Tomato, by misleading customers to think they are the same product and made of the same company Gromark. 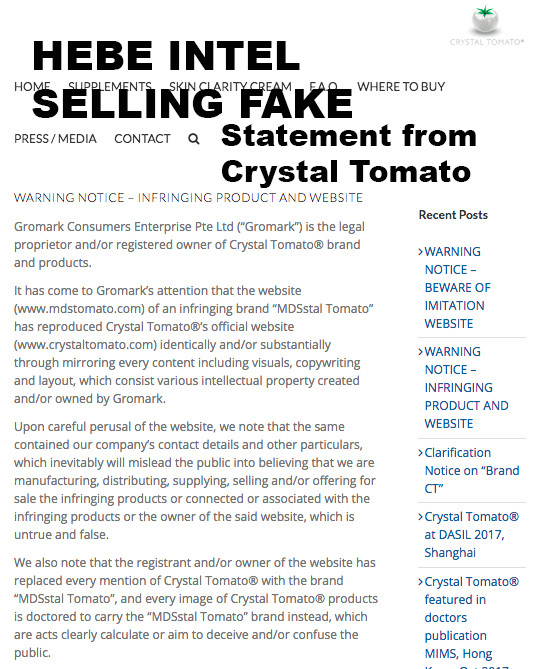 This is crytsal tomato site: https://crystaltomato.com , this company has been selling Crystal Tomato for years in Singapore, has nothing to do with MDS tomato, the ones Zhao claimed that he own the distributing rights from Gromark. Crystal Tomato can only allowed to be sold in Clinics, not on wechat from these scammers. These Chinese scammers never respect others intellectual property, as long as they smells profit, they will start to manufactory fakes and asking their franchisee to invest, so they can sell their fakes from their franchisee. At the beginning, all those pictures of MDS tomato is from Hebe Intl Skin Care, and all Hebe International Skin Care franchisee are starting to post these picture and selling these fake tomato pills. Even they sold it very cheap at $45 USD each box, however they produced these things at a unknown factory, these products has no factory name and factory address on them. Their cost to produce these fake pills is around $5 each box, starting at 10000 box. Zhao then trying to attracts franchisees to join his franchise business by giving each franchisee 500 boxes for free once when they join his franchise, he used these franchisees to sell these fake pills to the final customers. They sold these fake pills at $45 each, earning over $40 profit, asking customer to take these pills everyday like vitamin, so their skin can become white. However these pills are not FDA approves, not even CDFA approvals, they are illegal supplement to sell in USA, China, Canada and anywhere with government regulation. The factory price of the knockout goods is about RMB 35. At the beginning, due to the brand of crystal white tomato, the sales price of the MDS market started at around 600 RMB, and after a year, it was discovered by the public that it was totally different brand and different product. These scammers can no longer sell at a high price, so the price drops to about 350 yuan a box. The profit is 315 yuan per box, this is the only reason why so many people sell online because of such high profits. By selling fake product to misleading customers to pay the price for Crystal Tomato. After selling for more than a year, Gromark company has discovered the fact, they might lead to a lawsuit by continues selling fake. Zhao finds out MDS can no longer sells at a high price, and Sunshine charged him 25 USD for each box, he then thinking of contacting the factory direct and kicking Sunshine out of this knockout business. By contacting the factory directly and putting another label on these pills, he can start to sell high price again, and also he can earn Sunshine’s profit as well by kicking him out. After using Sunshine to manufactory these pills for over a year, Zhao found that there is a chance to produce his own and earn all the unethical profits by his own. So he ask someone in China to invest money with the new label Rise Hebe Tomato. By asking investor to invest $20 USD each box to produce these pills, he can earn all these profit before they can be sold. He made these pills at $5 USD, he already earn $15 USD before the pills are sold, he s very good at scamming investors who doesn’t know the fact about these products. Sunshine is a wanted escapee from China police because he and Zhao were selling fake injection medicine in China. Zhao was the ones who controls the inventory delivery in Anyang, Henan, where his home is. Since his dad works in the Commerce Bureau and he used to work in the police station in Anyang, Henam, before he ran to Korea to make a living. By having these connection, he can sell fakes injections in China without getting into jail. This is why Sunshine partner up with him for China inventory to delivery these knockoffs. However by controlling the China inventory of Sunshine’s products, he got a lot of contact info of Sunshine agents and distributors, he then stole Sunshine’s resources and distributors to sell his own fake. That is why Sunshine found that he were cheated by Zhao, after using him fr manufactory products for over a year, Zhao stole his factory resources and distributor resources, by kicking him out and saying that MDS is too low end, everyone knows it is fake, by selling his own label whitening pills, they can sell at a much higher price. Zhao is known of using such despicable tricks in this business, he used to produce fake Miracle Care set by spreading rumors of Miracle Care Authentic distributor. He will use all kinds of shameless tricks to framed his ex-boss Sunshine, or other seller Daejoo Medical for his own benifit. A typical China Henam Business style, by cheating and scamming. Zhao used to be a driver in Channel Academy, he then has the advantages to have the contact information of the students from Channel Academy, he used Channel Acadmey as a tool for him to get new clients contact information, and then by having these client resources, he then ask Sunshine to produce fake medical injections for him to sell to these students.